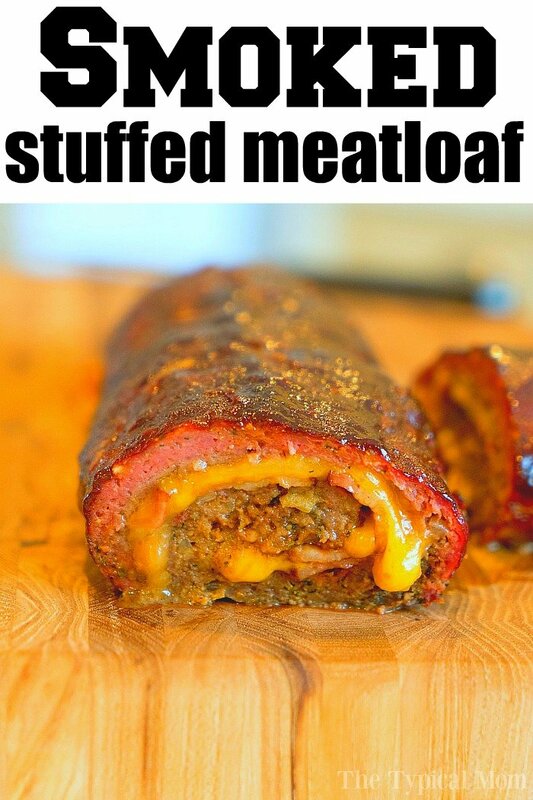 This smoked meatloaf recipe stuffed with bacon and cheese is so amazing! If you’re looking for the ultimate comfort food that oozes with flavor, try this! Wood chips or Pellets – We buy this variety pack to make our electric smoker recipes. We also love these Jack Daniel’s wood chips. Apple pellets were used to make this particular one in our Green Mountain smoker. Smoker – we have a simple electric smoker and just purchased this larger pellet grill & smoker! Timing – you’ll need this meat smoking chart to know what temp and how long to cook each meat. If your smoker doesn’t have a built in digital thermometer you’ll want that too. 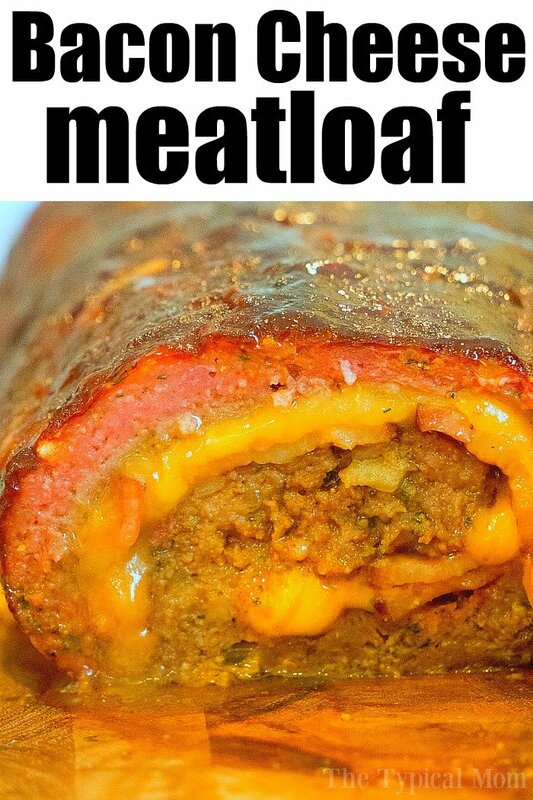 Our stuffed meatloaf recipe with cheese has bacon inside too! Yes you can leave both of these items out but seriously, just go all in and give yourself a treat this evening. 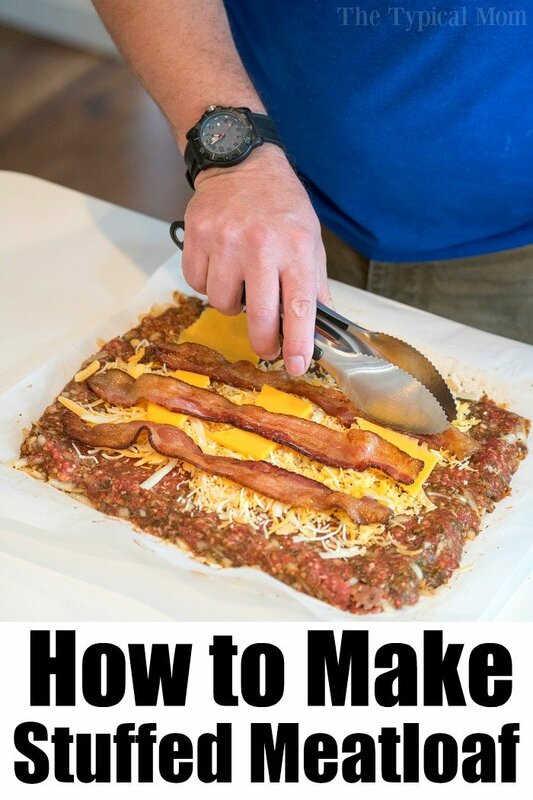 Here are a few step by step photos to show you how to make this amazing meat loaf recipe. We will include oven directions as well below. I guess wax paper would do too but I prefer this for rolling your meat loaf up. A baking sheet is handy too if you’re making this in the oven. A loaf pan could be used if you’re making a smaller/shorter version of this if that’s all you have on hand. Let’s talk choosing a bbq sauce. The first time we made this stuffed meat loaf we added this barbecue sauce which we buy all the time. It was SPICY! We think it amplified the little bit of spice it had in it while it was crisping up in the smoker. Now we use this honey style. Learn from us. If you really like heat then by all means use a spicy or somewhat hot sauce. Just know that the heat will be amplified in the last stages of cooking/smoking. Also, you can adjust the amount of cayenne pepper added to the meatloaf mixture itself. We do a like a bit of a kick but 1 tsp is great for myself and the kids. If my husband was making it just for himself he’d opt for 2 tsp. 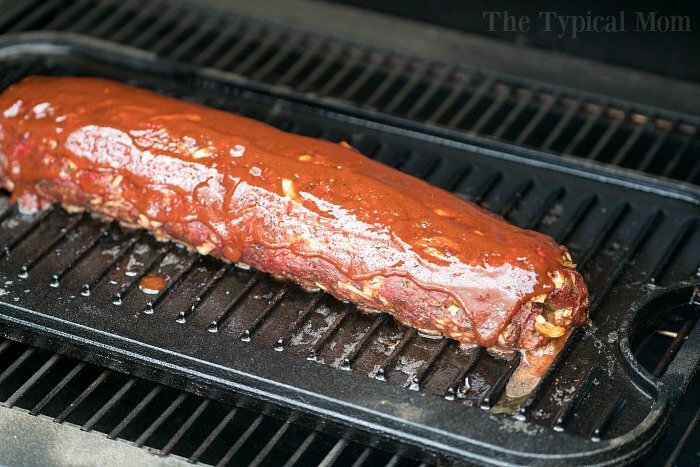 Why we like a grill pan vs. a silicone mat or baking sheet. Some people swear by silicone but I am not a fan. First off I’d rather use cast iron vs. any sort of plastic type of material for baking or grilling. Secondly, I love that this griddle/grill pan has ridges so a lot of the grease is kept away from the meat. If you flip it over it is a flat cast iron griddle too. Perfect for making pancakes on the stovetop, it’s super versatile. Of course it is your preference but if you’re making a cheese stuffed meatloaf it will be drippy. 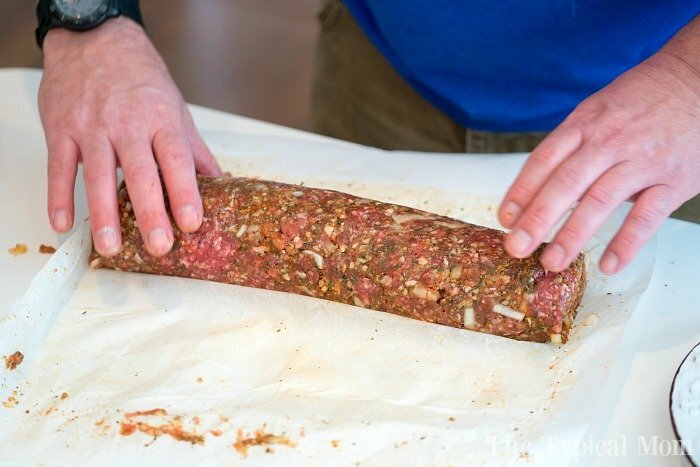 Ensure that your meatloaf mixture is the same thickness all the way across in the initial flattening out process. 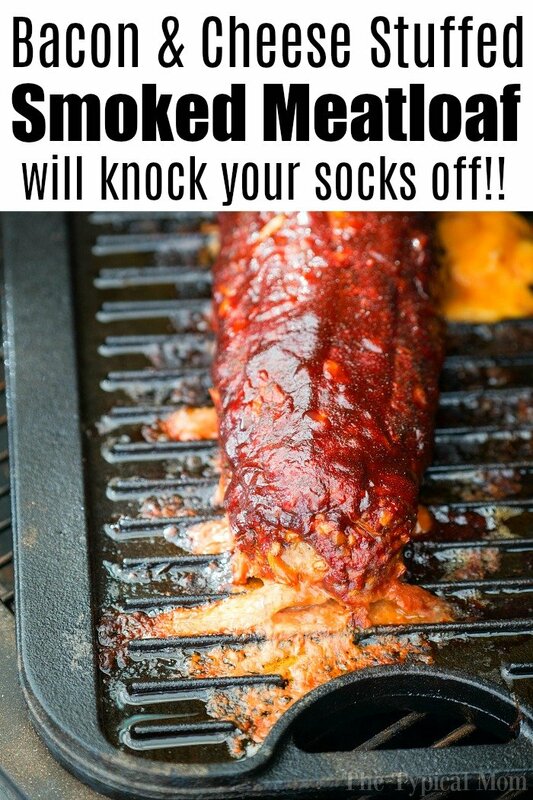 Preheat your smoker or oven. Do not open the smoker for the first 2 hours so it cooks evenly. Add barbecue sauce at the end to add even more flavor and crisp the top. Allow meat log to rest for at least 10 minutes so it stays in tact when you slice it. Serve with the best garlic bread recipe and enjoy! This smoked meatloaf recipe stuffed with bacon and cheese is so amazing! If you're looking for the ultimate comfort food that oozes with flavor, try this! Preheat smoker to 150, or oven to 350 degrees. Make sure there are pellets or wood chips inside your smoker. Enough to last almost 3 hours. We used apple for this smoked meatloaf recipe. In a bowl add all ingredients except bacon and cheese. Mix together well. Set out a piece of parchment paper on to your countertop. Lay your meatloaf mixture down and spread out so it forms a square and is about 1/2" thick all the way across. Sprinkle your shredded cheese on top, then place your sliced pieces of cheese (if you decide to add more) on top of that spread out. Lay your precooked slices of bacon down, spread out evenly. Lift one end of your parchment paper up and begin to roll this into a long log of sorts. Roll up in such a way that you can remove the parchment paper when you're done. 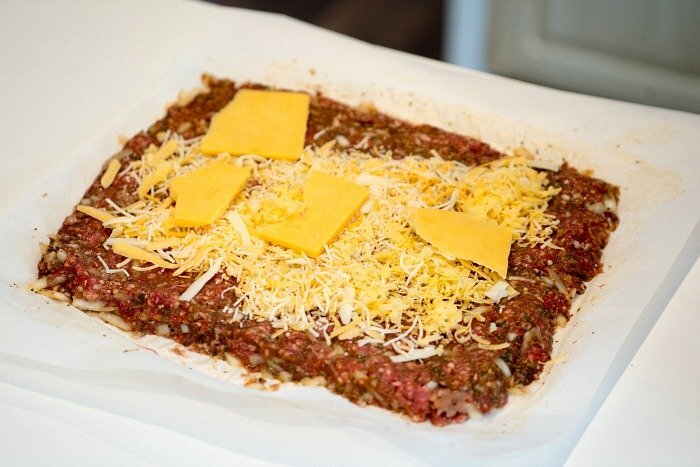 Once completely rolled up pinch the ends of your meatloaf roll so the least amount of cheese escapes in the smoking process. 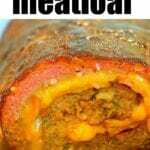 Lay meatloaf log on to a silicone mat or long grill plate as you see we used in this post. Place inside your smoker, on grates, in the middle. If baking in your oven it will take approx. 60 minutes to reach 150 degrees internally. Close lid and smoke for approx. 2 hours 15 minutes. If you want to add barbecue sauce on to the top pour some on at this time. Now turn your smoker/grill up to 400 degrees until it crisps on the outside as much as you'd like and internal temp reaches 150 degrees. 15-20 minutes worked for us. Take off griddle and place on cutting board. 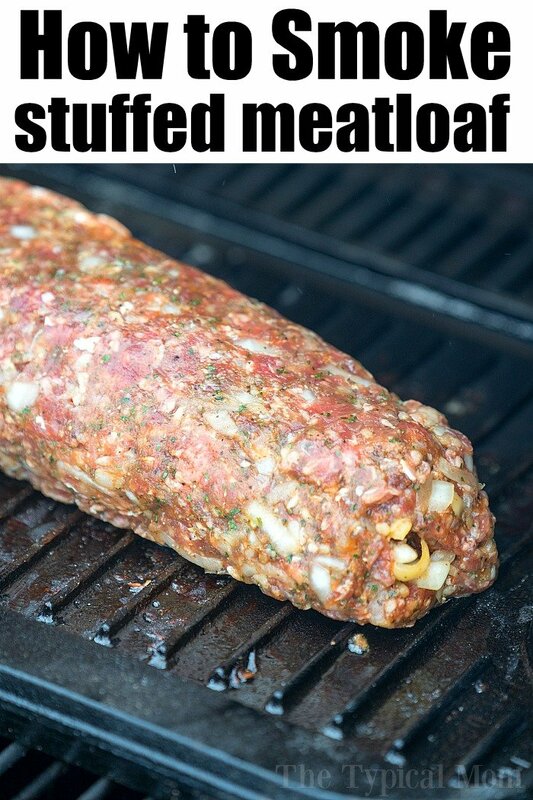 Allow smoked meatloaf to rest for at least 10 minutes before slicing. I think you may want to adjust the cooking temp to around 225 for a smoker instead of 150. Just my opinion but I think the cooking time for your temp will get an all nighter. I have this in my smoker right now at 225 and I’m thinking this will still take 3 or so hours to reach a temp of 160-165. No this is what we used and it turned out great. States to move up to 400 after 2 hrs 15 min. in recipe card. If you make your meatloaf thicker than stated it will take longer for sure. 1/2″ inch is recommended for this timing.